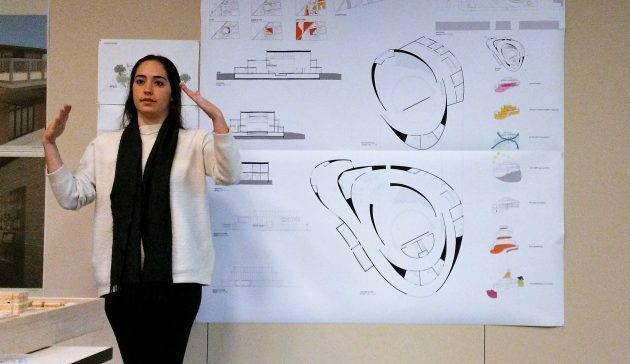 UO student Karin Ziv talks about her concept of a downtown performing arts center Wednesday. Architecturally speaking, downtown Albany would be a more exciting place if there was a way to carry out any of several redevelopment designs worked up by students at the University of Oregon. Moore’s architecture students had an assignment: Come up with designs of how three downtown sites could be redeveloped. The sites are the former St. Francis Hotel, the post office block, and the city parking lot behind the old Penney’s Building. A few years ago a Portland development company proposed to remodel the building as workforce housing at a cost then estimated at $10 million. Other students presented less ambitious ideas for the St. Francis. One said her approach was to keep the original interior structure and build a number of apartments or units for short-term stays by combining adjoining former hotel rooms and turning some bathrooms into kitchens. Student Karin Ziv’s idea was to build a performing arts center, consisting of sweeping curves outside and in, on the site of the Albany Post Office. Her design had an auditorium for 300-340 people as well as a restaurant and space for other uses, including art galleries. There’s no indication the post office has any plans to leave its leased building and grounds, but if Albany keeps growing the Postal Service may have to change sites eventually. 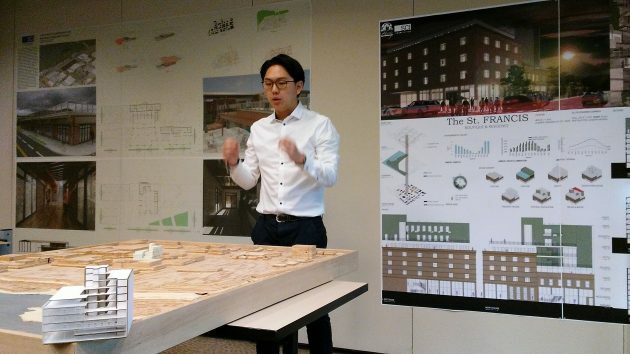 For the city-owned parking lot between the remodeled Penney’s Building and Water Avenue, students presented several concepts for turning the property into a combination market-restaurant-business center. Steven Liang’s design called for, among many other things, space for a permanent farmer’s market facing Water Avenue. How about parking, city officials wondered. Some of the student designs featured underground parking. But If anything like these ideas are ever carried out and bring in hundreds more people and vehicles downtown, a parking structure likely is inevitable. 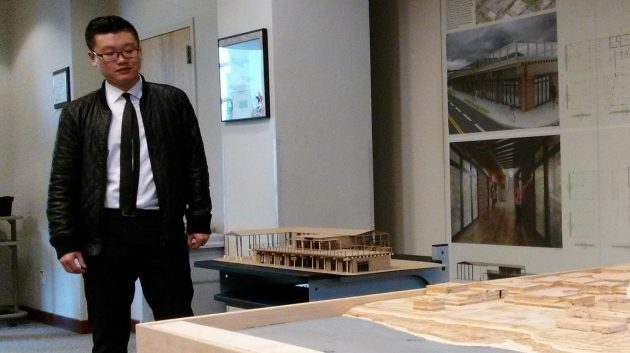 Allen Suwardi’s St. Francis design in drawings, behind him, and two models, one on its site in a plywood mockup of downtown, the other in the left foreground. Steven Liang with a model of his idea for a market building facing Water Avenue. Were these projects the students were hoping the city would do with “redevelopment” money? Doesn’t this teach them, at a young age, to depend on the government to supply all their needs? If that’s the case, why don’t we just have the government eminent domain the whole of downtown so they can build their paradise? Once again Jim, you show why you were such a dreadful candidate for mayor, and one so soundly rejected by the voters: No imagination, no understanding and no ability. Just an anti-government fanatic with no education of any kind who says the UN is out to take over Albany. I’m sure Trump will offer you a Supreme Court seat, any century now. Gee Bob, I know you have no concerns whatsoever about government getting bigger and bigger while outside influences push for exactly that, but why is it that you have such a hard time sticking to the facts at hand rather than to vague innuendo? PS – I got 2 thirds of the votes the mayor did… I’d say, for a first time running, that was pretty good… besides, I haven’t spent years buying votes with “forgivable loans” and “grants” all over town like the mayor has done… not having the ability to buy votes puts me at a disadvantage from the start… don’t ya think? This is a design program intended to develop design and presentation capabilities. Money, by the way, is brought in by much senior folks. Part of the curriculum should focus on finding private funding to carry out the redevelopment. If they can, charge forward. If they can’t, maybe there’s a reason to hesitate and not throw public money at it. Exactly! “The students were not to worry about economics.” Why not? Without economics such an effort is but a vague piece of art. Not worrying about economics has brought us the worst policies from Washington, some of which I hope are about to change. Hasso in essence tells us, “It doesn’t matter what it costs… just do it!” Just curious Hasso, do you apply this same standard when having work done on your house or car? As noted before, there was nothing “churlish” about what I said pertaining designs. Most of my “churlishness” appears when government wastes money in an effort to devise social engineering. That being said, it comes as no surprise when students petition and protest the government to force a $15 minimum wage. Or that they petition schools for lower grade standards. And counseling because their candidate didn’t win. Or the leftist ad infinitum we see on college campuses today. Vision & creativity surely brings out the curmudgeons!